Hi, my name is Emerald! 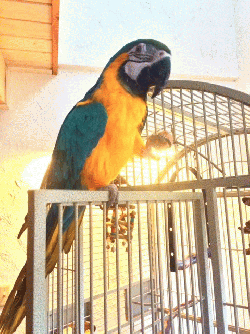 I`m a 22-year-old blue and gold macaw, and I`m a very sweet girl. My foster mom jokes that I`m mute because she says I`m the quietest bird she`s ever fostered! I do like to laugh and say "hello" and will even mimic a burping sound on occasion. My favorite thing to do is dance and swing on my bird swing. I don`t mind dogs at all and they don`t make me nervous since I grew up around Great Danes and smaller dogs. I`ve been around kids, but do have to admit that sometimes I can be a bit of a sneaky biter, and will be at my best in a quieter, bird-savvy home. I can step up on command and am stick trained so taking me in and out of my cage isn`t a problem. My favorite treats are walnuts, apples, and corn on the cob. Are you looking for a big, beautiful girl that will make you laugh every day? Ask for me, Emerald!